Customise ticket logging forms with the drag of a mouse. Call Forms provide an extension of SupportDesk functionality by allowing you to build unique Forms for all types of call, be they Incidents, Problems, Equipment Requests, New Starters, Inventory items, Activities or Contracts. Using Drag and Drop features you can quickly build the Forms you require. 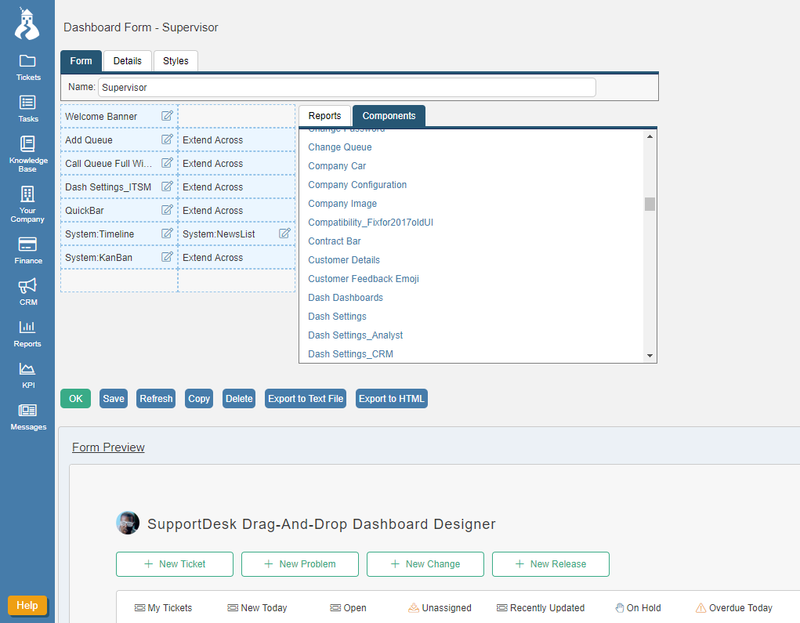 To make use of this feature your SupportDesk system must have the HouseForms Module, and the Self Service Portal if Forms are going to be presented to Customers to capture their requirements. Extra Fields can be created in SupportDesk, and will appear in the Call Form builder, so that all required information can be captured in each call-logging process. Associate Call Forms with Service Desk Processes. Once Forms have been created, they can be associated with Folders. So for instance, it is possible to select a specific Incident form for use by service desk Analysts in the Incident Folder, and also a form that will be used by Customers (WebGuests) for logging Incidents. Special Forms such as 'Equipment Requests' or 'New Starter' Forms can be associated with call templates, which are named 'QuickCalls' in SupportDesk. Customers can then be given a set of call templates, each with a unique form, depending on the type of call.